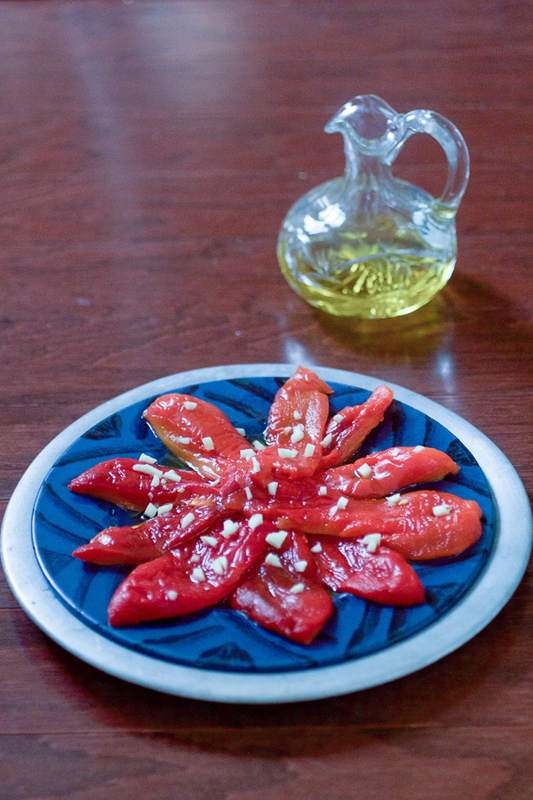 Roasted red pepper salad, sprinkled with garlic and olive oil, is one elegant salad. 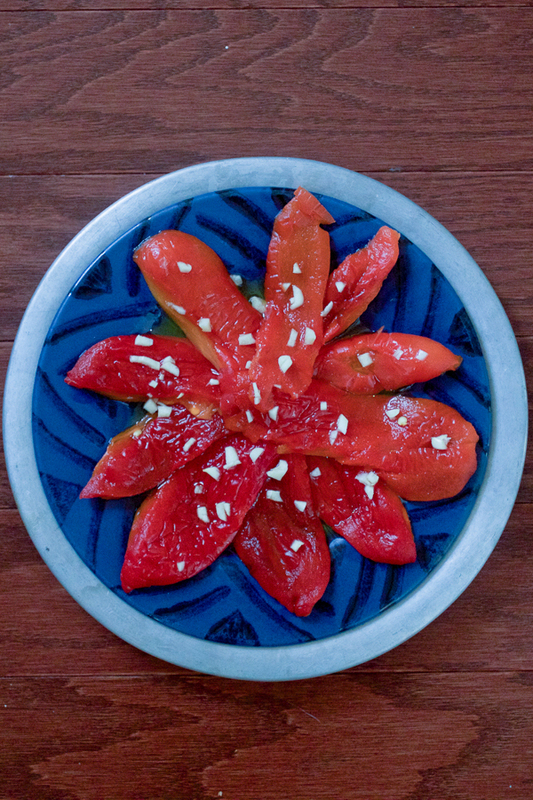 Less conventional, but just as bright and colorful as the caprese, this one has the potential to become your new go-to. You may have noticed, if you browsed the balkanlunchbox recipe section, that there aren’t too many salad recipes on this site. That’s because I’m not a big fan. Salads are healthy, wonderful for the body and the mind, but the foundation of most salads is a boatload of lettuce. And biting into a pile of leafy greens is about as appetizing as biting into a piece of paper. Admittedly, my aversion may be because I haven’t mastered making a good salad. Somehow the ingredients mush together, become lifeless, and are never ever like the ones in Chop’t. So, I don’t make salads much. But recently, while browsing the local grocery store, these two red peppers reminded me of an old family favorite that I haven’t seen much outside Balkans. 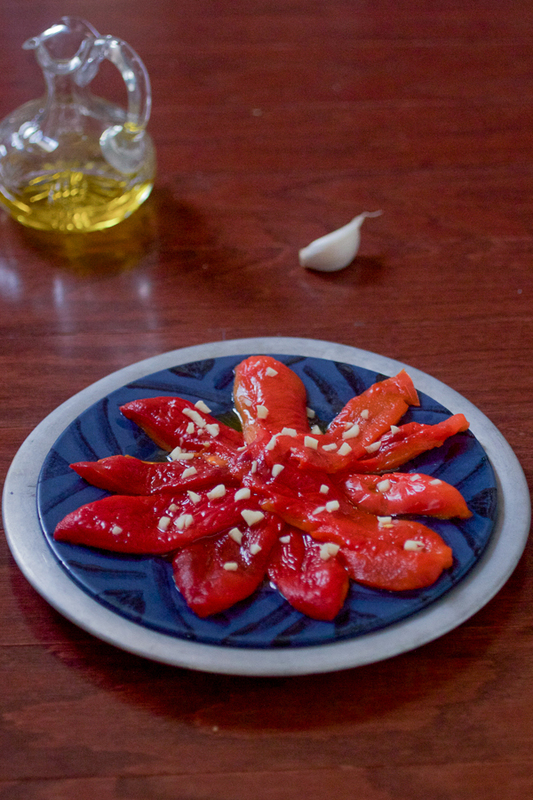 It is a simple roasted red pepper salad, combined with garlic and olive oil. It is smooth and cold: a salad you eat alongside your meal, not before or after. If you find garlic heavy, skip it, and opt for the peppers alone. But I urge you to at least give the salad as a whole a try, it may surprise you. P.S. Other roasted red pepper delicacies I love are the classic eggplant and roasted red pepper spread called ajvar, also the roasted tomato and red pepper classic called pindjur, and finally the creamiest peppers in the world. 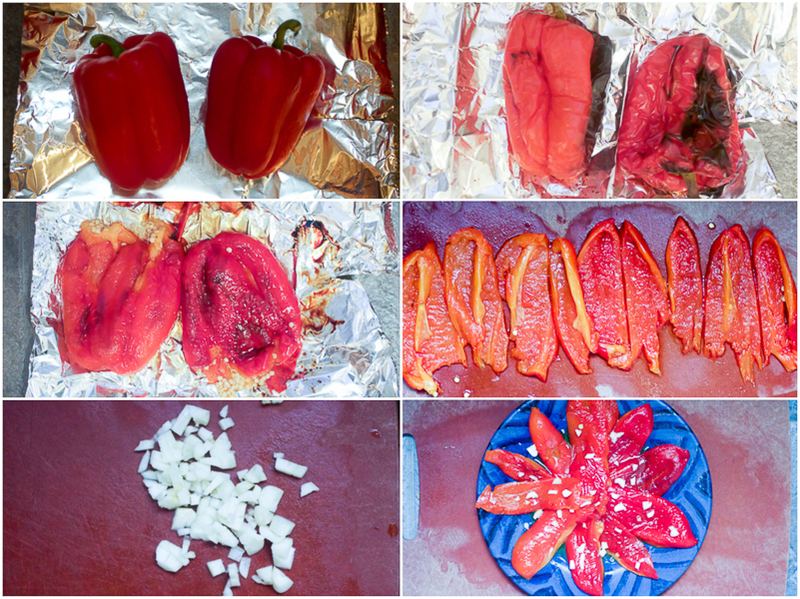 Place peppers on a piece of foil and put on the highest rack. Bake 15 minutes on each side. The skin will start to peel, and blacken in places. 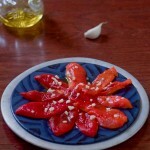 If you notice too much blackening, lower the temperature a little bit so the peppers don’t burn. After 30 minutes, take out and let cool. Peel the skin off. Cut each pepper in fours lengthwise, and clean the seeds out. Keep in the fridge for an hour. Take out, sprinkle with minced garlic and olive oil. Add salt and pepper to taste. Thanks for liking the look! I worked with a capable (and patient) designer. 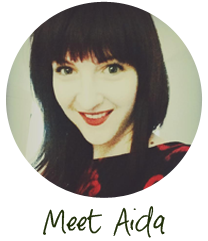 I generally write in English and translate to Bosnian and I’m working on translating all recipes. You should be pretty good as far as the language, you’ve immersed yourself in the best possible way – by living somewhere.